People: we just can’t be trusted, can we? This was once again proved right at the Las Vegas branch of Madame Tussauds, where a waxwork of Nicki Minaj has been the subject of numerous inappropriate photos. Minaj’s waxwork appears on all fours, supposedly intended as a homage to her pose in the video for her song Anaconda. This in itself has raised questions as to why she’s been portrayed this way instead of on two legs, with a microphone. Now there have been a slew of photos of people in inappropriate poses with her appearing online. 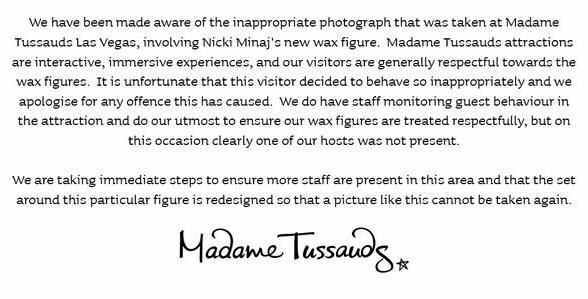 So there you go, Madame Tussauds have had to make sure extra staff are present in the room, so people don’t pretend to bang a waxwork of Nicki Minaj. Previous article Is Boomtown Fair The Maddest Festival On Earth?